The SAReads Literacy Academy for teachers launched at one pilot campus this fall. 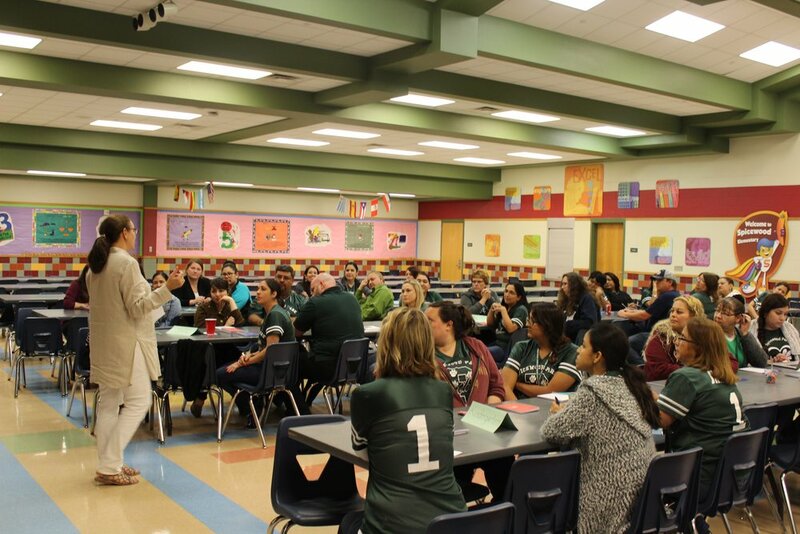 Spicewood Park Elementary principal and staff are partnering with SAReads to help deliver appropriate targeted instruction to ensure socioeconomically disadvantaged children become proficient readers. We enlisted an English Language Arts and Reading Specialist from ESC Region 20 to train teachers throughout the year to build their knowledge of phonological awareness, phonics, comprehension, vocabulary, and fluency. Training also emphasizes the importance of data-based decision making about students' instructional needs. Training is followed by ongoing coaching and teamwork in a context of strong leadership and support. Innovation on this scale is challenging and must be carried out consistently over enough time for teachers to change their instructional practices. When teachers participate in sufficient training on reading development, language structure, and effective teaching procedures, and receive help to apply what they learn during the year, struggling students in grades K–5 will improve significantly in all areas. With the help of our exceptional education partners, the SAReads Literacy Academy is committed to bringing even the most as-risk students up to the national average in reading. SAReads tutoring grew 60% this fall and now includes more than 170 4th graders! Kindergarten through 3rd grade students continue receiving science-based reading instruction, while 4th graders receive additional writing instruction using Google Classroom. This semester 458 students received tutoring from 223 preservice teachers from Texas A&M University - San Antonio. This is the largest cohort of SAReads participants to date.